On July 13, 2018, Dawn Smith, a doctoral student in Educational Policy and Leadership, defended her dissertation at North Island College in her traditional Nuu-chah-nulth (NCN) territory (Pt. Alberni- PA), making her the first UBC Indigenous student to do so in their own community. Her dissertation explored the challenging process of Indigenizing higher education, specifically the “epistemological collisions” experienced by Indigenous educators teaching Indigenous content to mostly non-Indigenous students, staff and faculty. “I was writing about decolonization, Indigenization and reconciliation, so I thought it would be an act of reconciliation for the university to bring this work into our community, where they could actually benefit and hold me accountable for what I was writing and saying […] It was a dream to defend in my own territory.” Dawn shared her dissertation with her uncle and grandmother before delivering it to her committee for approval. 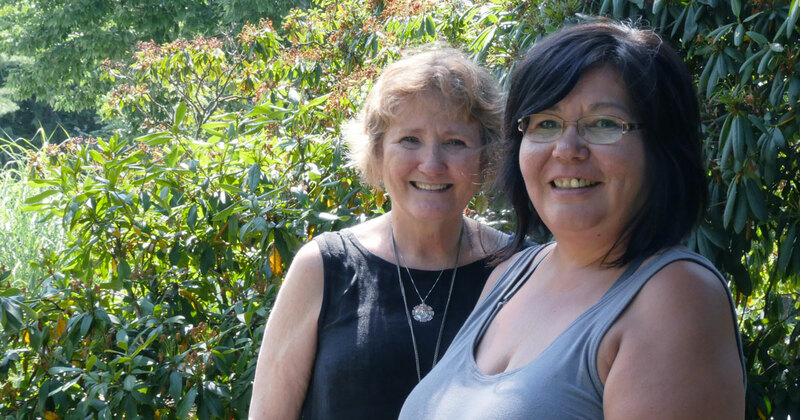 Dawn and her supervisor, Shauna Butterwick, described the event, which opened with a prayer to the ancestors to bear witness, and closed with comments from Dawn’s family assuring her of their ancestors’ approval. “It was an enormous pedagogic event, both symbolically and in practice. We [the committee] became learners in this context, which was not just 'off campus, but on land,'” noted Shauna. Deirdre Kelly, a committee member, further emphasized the importance of land by invoking the words of educational scholar George Sefa Dei: "'Indigenous' [is] about primarily the Land, a close relation and association with the Land as a place and sacred site. There are teachings of the Land and Mother Earth, which constitute the source of Indigenous cultural knowings." Dawn described the experience as overwhelming: “I felt empowered by the institution to do this kind of work and bring it into the family and community where I was held accountable for capturing our teachings and values, and they were validated.” She recounted the devastating toll of the Indian Act and residential schools on her own family; however, it was her great grandmother who believed it was important to get an education – to understand both ways of knowing – to thrive and survive in a white man’s world. The Faculty of Graduate and Postdoctoral Studies was honoured to support and partially fund this opportunity as a component of a larger TLEF-funded initiative on Fostering Excellence in Graduate Supervision. The initiative includes goals for further supporting Indigenous graduate students. Following a Forum in August 2017, a working group was formed to develop a set of goals. We are currently exploring the development of a Welcoming Event for all new Indigenous graduate students; ways to extend funding opportunities for Indigenous graduate students; and a collaboration to expand the SAGE (Supporting Aboriginal Graduate Enhancement) model across campus (Please contact theresa.rogers@ubc.ca for more information).